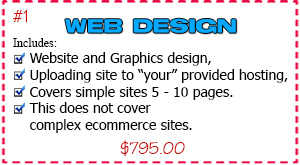 There are several things required to having a website to give you a professional business look. Using one of those builders online only gives you a subdomain of the online builders site instead of having your own domain as well as having to have and see sponsered ad's on your site that you don't need. 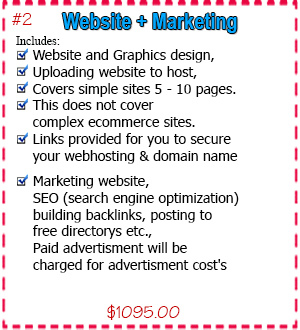 Lets take a quick look at what you need to have your own website. 2nd, you are going to need a domain name (www.yourwebsite.com,net,org,etc.) which requires annual registration. 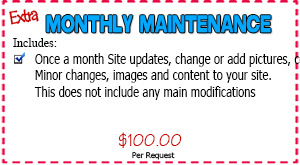 3rd, you will need Hosting space to store all your website files and images, again another annual cost. 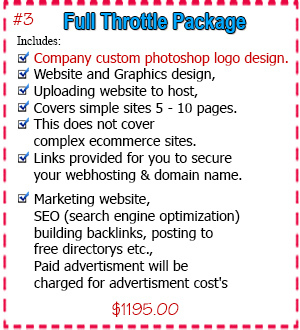 After those things are configured and done, site uploaded, you will have your new website and be ready to launch. It doesn't end there, as there are still things that need to be done in order to get your website indexed into the search engines. 4th, comes the painstakingly task of trying to move your site ranking up through the search engine toward the front page of the results which by the way isn't easy. I'm not going to tell you that I can do that 100% of the time and never make promises, but will give every effort to do my best. Lastly, you will need to keep your new site updated with pictures, content etc. along with the content or your new site. After selecting what you would like done you will be directed to a form to supply that information as well as providing you with links to secure your hosting and domain name. When you sign up for your hosting & domain name you will be provided with a credentials by email which needs to be forwarded to us for access to the hosting account. Contact us if you need us to sign up your hosting & domain for you. Below you can select what you would like us to do.